How do I backup my wallet and set a password? Backing up your wallet is crucial for securing your blockchain assets and allows you to regain access to your funds on another device in the case of events like device failure, theft, or loss. You only need to backup your wallet once but doing so will ensure that you can regain access to your blockchain assets at any time if you experience problems like your computer or phone breaking or being stolen or lost. Exodus allows you to try the wallet before having to back it up. We want to make sure that Exodus is right for you before you go ahead and write down your 12-word phrase or password! Once you decide that Exodus is for you and make your first deposit, no matter how small and for whichever asset you prefer, the Backup option will be highlighted with a red exclamation mark so that you can start the straightforward and simple backup process. Backup your wallet in a private location where no one is able to see your screen. Also, be sure not to backup your wallet over a public WiFi connection, where hackers can snoop on you. 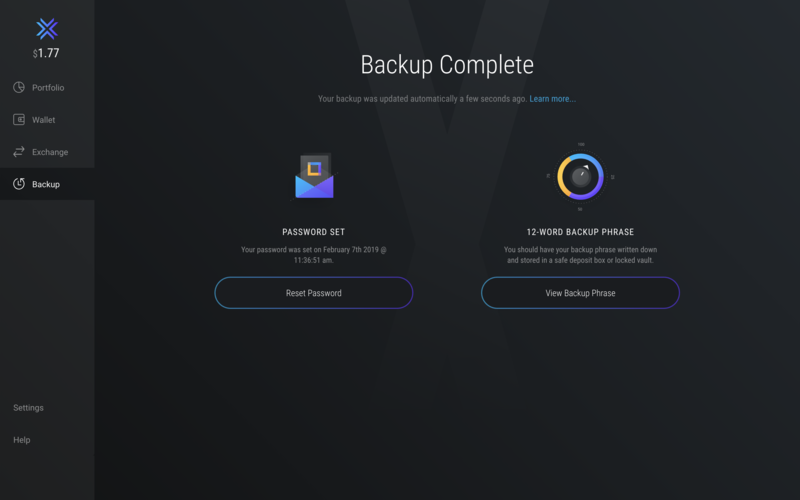 To back up your wallet, click the Backup tab. Create a strong, secret, and unique password, enter it in the box, and click “NEXT”. 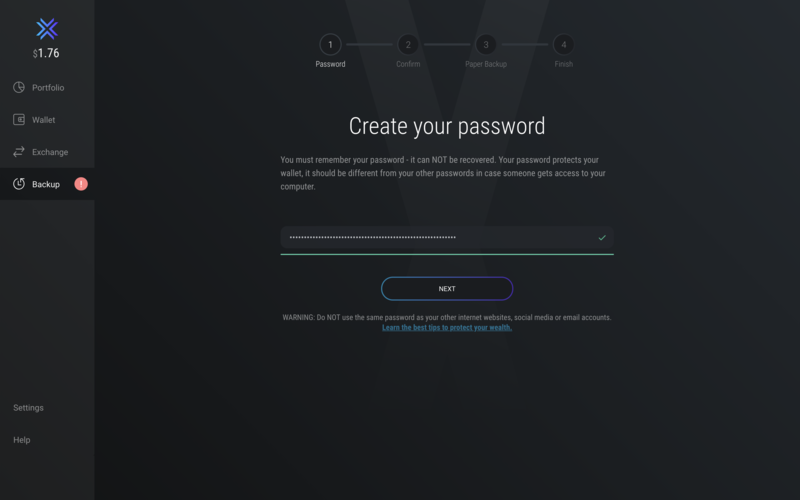 We recommend using a password manager to create your password, as they can generate highly random and strong passwords for you. If you decide to create it yourself, make sure it's not the same or similar to any other password you have ever used! Re-enter the password and click "NEXT"
If you forget or lose you password, no one can recover or reset it for you. This is another advantage of password managers: they remember the passwords so you don't have to. 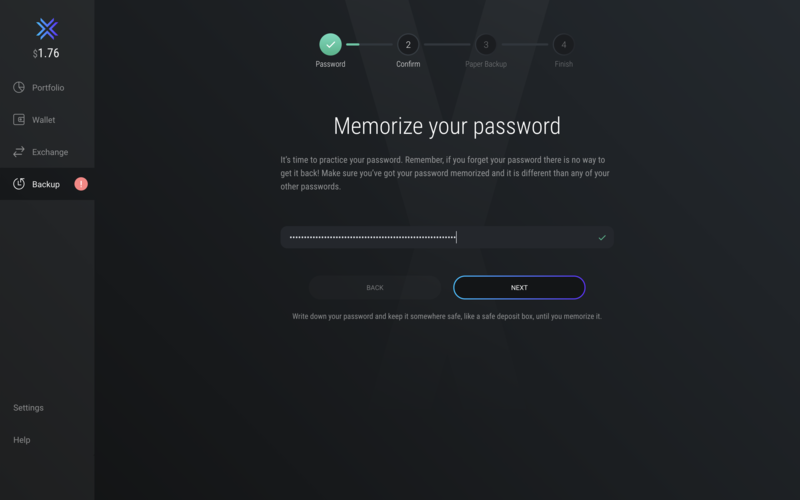 If you created the password yourself, re-entering your password will let you see if you remember it. 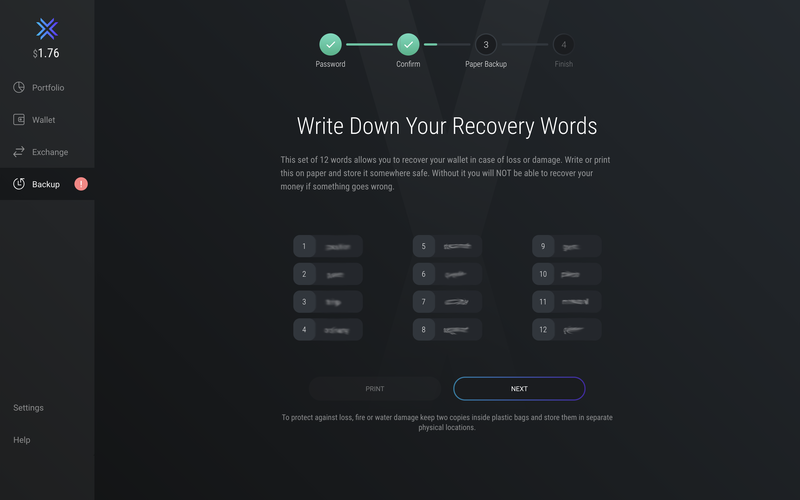 Your 12-word recovery phrase is displayed. Write the words down in the correct order and put them in a secure place where only you have access. Also be sure to make more than 1 copy of your 12-word phrase and to keep copies in separate locations to prevent a single point of failure from events like fires, loss, etc. These 12 words (your “seed” or recovery phrase) are your master seed that generates all your wallet’s addresses and private keys. In other words, with this phrase, ANYONE can access your wallet’s funds anytime and anywhere from Exodus or another wallet. For this reason, do not store your 12-word phrase in any digital format, such as a screenshot or picture on your phone, a document on your computer, USB drive, or in the cloud (e.g. Dropbox), an email, etc. Hackers can access digital files and information, but they can't access an old-fashioned piece of paper! 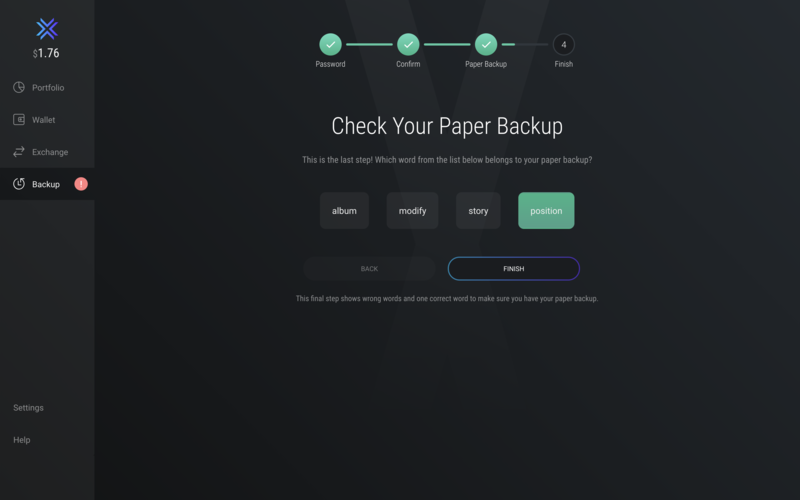 Confirm a word of your paper backup. And that's it! You only have to go through the backup process once. Your wallet will continuously backup, even if you never open Exodus. This is because your funds live on the blockchain and Exodus is a blockchain interface that reflects the data found there. How do I restore from my 12 word phrase? Do I have to backup every time my wallet updates? How do I keep my money safe?